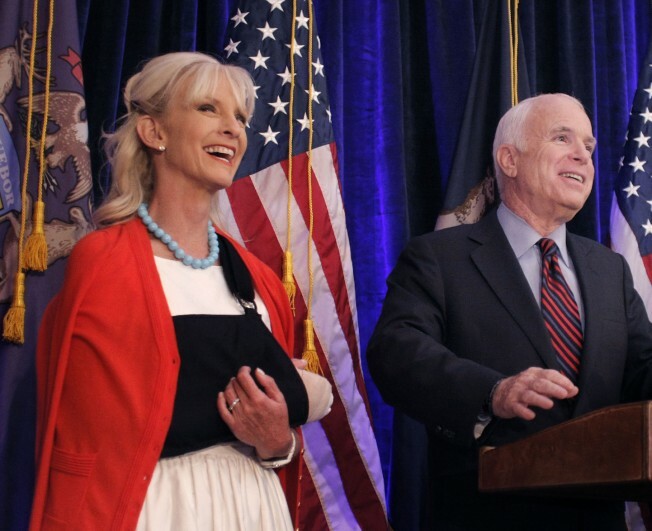 Cindy McCain had her arm put in a soft cast and sling after it was injured while shaking hands. Cindy McCain was rushed to a Michigan hospital Wednesday complaining of pain caused by shaking too many hands. "I'm absolutely fine," the first lady hopeful said afterward while sporting a soft cast and sling on her right arm. But seriously, a handshaking injury? "During the rope line, an enthusiastic supporter shook Mrs. McCain's hand and exacerbated an existing condition," a statement from the campaign said. "Out of an abundance of caution, she decided to leave the event and visit the local hospital for X-rays, where she was treated for a minor sprain. We appreciate everyone's concern, and she is back on the campaign trail now." With her history of carpal tunnel syndrome, for which she had surgery years ago, one has to wonder if Cindy McCain is fit to endure the rigors of life in the White House.